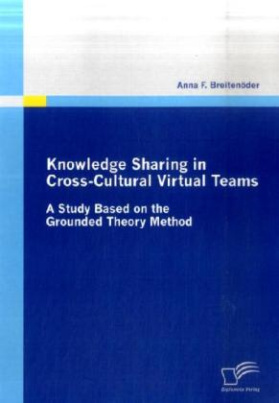 This book presents an initial attempt to a theoretical model to identify how knowledge is being shared in cross-cultural virtual teams (CCVTs). It has been analysed and created from the results of interviews conducted with experienced managers and intercultural coaches from the CCVT environment. It contributes to the pool of literature in three main points. Firstly, the model integrates a range of CCVT related themes, which are critical for CCVT work and have been repeatedly mentioned by experts with practical experience in the CCVT environment. Consequently the study is able to deliver some guidance for good practice for people working in CCVTs. Secondly, it provides a general overview on the CCVT environment taking into consideration knowledge sharing, which is one of the most critical requirements for today s global players who aim to achieve competitive advantage. Thirdly, related theories came up with similar findings, which led to the fact that the tentative theoretical framework in the present study cross-validates these theories to a considerable extent. §The study identified a cross-cultural barrier that has to be overcome by CCVTs to effectively share knowledge, which is needed from each of the CCVT members in order to collaborate effectively and achieve successful project outcomes. Five factors, counteracting the breakthrough of the cross-cultural virtual barrier turned up. Thus, reasons for which knowledge sharing is restricted in CCVTs, are the ineffective use of communication channels, the existence of time differences, insufficient skills in the foreign language that is used in the particular team, the fact that people do not share the same perceptions of reality across the world, and a lack of company support, meaning insufficient awareness for the situation of CCVTs. These five factors were found to need to be confronted with appropriate strategies in order to not be detrimental to knowledge sharing in CCVTs. However, if companies were oblivious to the five factors and therefore failed to support their CCVTs, or if CCVT members were unaware of the respective new conditions, appropriate strategies would not be carried out. In this case, it was identified that as a consequence of the existence of the five factors in CCVT interaction, a negative spiral could be getting started. Starting with reduced transmission of context, which caused misunderstandings and conflicts and required more time needed to accomplish communication processes, the negative spiral could lead to CCVT failure. If companies and CCVT members, however, were aware of the CCVT situation and the strategies were carried out in order to deal with the five factors to overcome the cross-cultural virtual barrier, a positive spiral could be initiated and could lead to exceptionally good project outcomes. The strategies were to provide fundamental company support, and on this basis, CCVT specific management, leadership, selection, and training.